Pressure sensor HySense® PR 190 The HySense® PR 190 with its high-grade steel membrane, is a pressure sensor for mobile applications. Optionally, it is available with Hydrotechnik ISDS, the automatic sensor detection system. It is available in several pressure ranges from -1 to 1,000 bar. 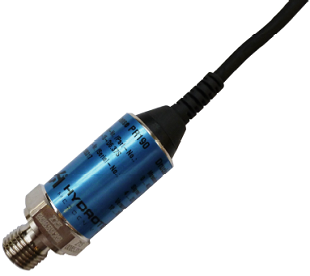 The HySense® PR 140 has a protection type of IP 68 K. As an electrical measuring connector it has open ends, 4 wires and a connection cable of 1.5 meter.